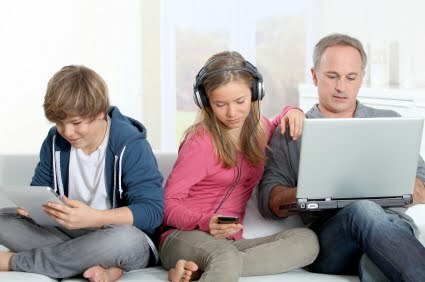 For something most of us didn’t even have 10-15 years ago, wifi has become virtually indispensable in our homes. Sixty-one percent of American homes have wifi. And wifi can be maddening if it fails to reach all rooms in our home. Wifi provides the internet to more and more devices every year. Our first router back around 2003 served two laptops. Today, in an average home, many more devices are linked to wifi routers including laptops, mobile phones, game consoles, portable gaming machines and more. And more devices will continue to login. Devices such as your refrigerator, washing machine, light bulbs, door locks and those little Dash Buttons from Amazon that let you reorder things at the push of a button. Does your wifi reach all areas of your home? If it doesn’t, you are losing valuable functionality. In this column, we’ll tell you how to easily find dead spots in your home and what you can do to get the internet throughout your home. You may already know what rooms don’t have internet, but perhaps you haven’t ever tried to use your wifi connection in your guest room or in the basement. Guests who have slept there might have been too polite to mention it. There are apps for your cell phone that will measure your connectivity as you move about the house. First of course, you have to connect your phone to your own wifi. If you need help with that, check this week’s link post at www.familytechonline.com for help. Once that’s done, go to your phone’s app store, and search “wifi.” You will find a variety of tools. I have always used Wifi Analyzer. The app shows you the strength and channels your wireless router uses. Make a quick hand-drawn map of your home’s layout. On the app, touch the icon that looks like an Eye at the top right and chooses Signal Meter from the menu. Near the bottom, touch the button and choose from your wifi name from the list. Then, walk around the house and record the signal strength in each room. Ideally, the meter should be in the green throughout. When you are done, make a list of the rooms that had less than -60 dbm. Are they rooms you need to have internet access in? If your router’s signal cannot reach rooms where you need the internet, there are extenders and other devices you can purchase to extend the reach of your wifi signal. An extender is a small box that plugs into an electrical outlet. It receives the signal from your wifi and then rebroadcasts it on another channel. The idea is to put it somewhere between your router and the room where you do not have a strong signal. Where you place it should still have a good enough signal and the new signal it puts out should hopefully reach the poorly covered area. Netgear and TP-link are manufacturers I have some experience with and they make extenders. This week’s link post will have Amazon links the products mentioned here. Earlier this year, I moved our router to the upper level since we did a lot of our computing in the bedrooms there. That demolished coverage in our basement, and we had occasional need for cover age there. An extender would not be a good solution in that situation. Instead, I opted for a powerline extender. A powerline extender has two boxes. One box plugs into the wall near your router and connects to your router with a network cable. It takes the internet signal from your router and actually sends it to the second box through the powerline in your house. The other box sits in the room that otherwise wouldn’t have internet connectivity. Some extenders you have to plug a network cable between it and your device. Or, you could buy a second wifi router and hook it in and have a strong wifi signal in that room. Some of the newer ones have their own wifi signal on the other end. Read the product descriptions carefully before choosing one. The ideal solution would be to have an electrician run network cable throughout your home. That is on my list for the custom home I’d build after winning the lottery. That, and heated bathroom floors. This column will appear online Saturday, November 21, 2015 at 9 AM EST. It is available before in the November 20th issue of Prince William Today on sale at these retailers beginning this Thursday, November 19th in the afternoon. For apps for iPhone, to to ITunes and search the app store on "wifi strength"
In the column "Don’t trust yourself to be your computers’ back-up plan - October 2, 2015" I suggested one cloud service to backup your computer to could be Microsoft's OneDrive. That recommendation hasn't changed, but Microsoft did recently make a fundamental change to OneDrive that might make it not the best choice for some. I wrote then how Microsoft had promoted in October of 2014 that OneDrive was going to be unlimited storage. Unfortunately, Microsoft has withdrawn the unlimited storage promise because, well, some people were using it for unlimited storage. The cited some users storing as much as 70 gigabytes. Now the most you can buy is one terabyte. It is included with an Office 365 subscription. A terabyte should be sufficient for backing up most people's computer. It is for mine, and for my family members. What's truly unfortunate, is they also took the option of downgrading their storage plans. Now they will no longer offer the 100 gigabyte and 200 gigabyte paid tiers. And new users for the free service will only get five gigabytes, not the previous fifteen. Microsoft has made some positive steps recently by abandoning their Microsoft platform first strategy and actually producing good products for the Android platform. And they have made a couple of excellent acquisitions recently with products like Sunrise and Wunderlist; two apps I use daily. This OneDrive announcement is a big step backwards. As other companies race to add more value to their cloud storage opportunities, Microsoft steps back. As I mentioned in the column, there is one unlimited storage offering that is truly unlimited; at least unlimited from the get go, and not an add on as was Microsoft's. That is Amazon's Cloud Drive. For $60 a year you get truly unlimited backup. Some Amazon customers have received offers from Amazon for a free trial year of Amazon Cloud. Everyone gets at least a 90 day free trial. And I found it backups files faster use Arq Backup then did OneDrive. This column will appear online Saturday, November 11, 2015 at 9 AM EST. It is available before in the November 10th issue of Prince William Today on sale at these retailers beginning this Thursday, November 10th in the afternoon. This Family Tech from 2014 is mentioned in this week's column. It has tips on performing tech support when visiting relatives over the holidays. Did you hear anyone on your Thanksgiving visit with family say, “Hey, you are so smart with computers, can you see why my PC is running so slow?” If so, while the rest of the family visited or watched football, you slaved away over an infected PC, maybe with 15 toolbars running in Internet Explorer. Maybe I can help other family techs by offering a few tools to get them through the Christmas holiday visits with family. The first thing to do when sitting down at a sick PC is to learn something about it. Go to the Start button, and choose search. Type in “System Information.” It will give you an option to click for system information. The report that comes up on the screen tells you a lot of information. What you are concerned with is the operating system, amount of memory and processor. If it is an XP machine, diplomatically wash your hands of it. Explain that XP last shipped PCs in June 2008. Their PC is now at least 6 years old and maybe as old as 13. It would be far more economical to purchase a new computer, than upgrade their existing one, if that is even possible. At this point, tell them you have to limit your help to helping them choose a new computer. If all they do is get email and web surf, nudge them in the direction of a Chromebook. With Chromebooks, you do not have to worry about backups or viruses. If they can’t afford the $200, a minimal PC will cost, let them know where they can get free computer access, such as at the library. Trying to maintain an XP machine is soul-suckingly awful. If you must, you can run some of the processes I’ll describe later. If it is Windows Vista PC with at least a 1ghz processor and a couple gigabytes of memory, you could help them buy a copy of Windows 8 and install it. Or, they can wait a year to see what the system requirements of Windows 10 are going to be, and then either upgrade to it if their PC allows or purchase a new machine. If they have Windows 7 or 8, and are having problems, then there are things you can do to help. The first thing to do is backup their files. Login as each of the accounts on the PC and use File Explorer and navigate to their c:\users folder. Right click it, and choose Properties to find out how big it is. For most people who primarily use their computers for email and web surfing, the contents on their hard drives are usually very small. Most often, smaller than an affordable 16 or 32 gigabyte USB drive. Buy them one of the drives, and backup the contents of their c:\users folder. You will need to login as an administrator, or login as each user on the PC and copy their c:\users\their_name folder individually. If you do nothing else for your family member, do the following. Most likely they are not backing up anything, ever. For about $10 you can save them should things truly go south. Leave them the USB drive so they don’t worry about you being nefarious with their files, but tell them not to do anything with it. It is only for you to use when visiting. Before you leave for your relatives, go to Ninite.com and download some utilities to your own USB drive. Ninite is about the only safe download site left. Get a copy of the Chrome browser, and under security, Essentials, Malwarebytes, and Spybot 2. Under Utilities, get WinDirStat. Check to see if they have an antivirus software installed. If not, install the Microsoft Essentials you downloaded from Ninite. Reboot the computer to Safe Mode and run a virus scan, and after a MalwareBytes run and Spybot 2 scan. These can take time, so start it fairly soon after arriving, and let them know the computer is off limits until they are done. If things are still flaky after you run these scans, byte the bullet and do a restore. The column mentioning this column will appear online Saturday, November 14, 2015 at 9 AM EST. When it is posted, it will here on on this blog. It is available before in the November 13th issue of Prince William Today on sale at these retailers beginning this Thursday, November 12th in the afternoon. This column will appear online Saturday, November 7, 2015 at 9 AM EST. When it is posted, it will be on this blog. It is available before in the November 6th issue of Prince William Today on sale at these retailers beginning this Thursday, November 5th in the afternoon.